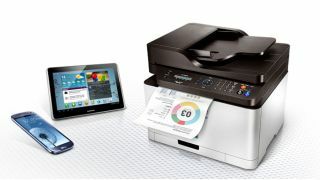 Samsung has launched its BusinessCore Printing Solutions for small to medium sized businesses in the US. BusinessCore Printing Solutions provides integrated document management and output management features for Samsung's A3 and A4 multifunction printers built on the XOA Embedded open platform. The product is designed to improve efficiency of managing, printing and sharing documents in the work place, while ensuring document security. It is easily installed without a server. The suite comes in two forms, the Document Management Pack and the Output Management Pack. The Document Management Pack is mostly about productivity, employing SmarThru Workflow Lite to allow users to process and distribute documents to multiple destinations via automated document capturing, scanning, and routing. It supports Zone OCR for automatic classification of special text and barcodes. This pack also includes Cloud Connector, which supports Microsoft SharePoint Online and Google Drive, and Secure Login Manager, which includes a variety of authentication methods to ensure company file security. The Output Management Pack is aimed at those looking for even more security and cost efficiency. SecuThru Lite 2 encrypts files and requires user authentication before a document will print, while the Usage Tracker monitors how much printing, photocopying, scanning or faxing a user is doing, allowing management to identify areas where savings can be made.